I passed my practical test on my first attempt with Sevan. I had no driving experience what so ever and was extremely nervous. However with Sevan's help, consideration, calmness, and patience he had with me, I developed the precise skills needed to become a safe and confident driver. He always explained everything in a way which was clear and easy to understand. He gave excellent constructive feedback enabling me to evolve my self. Sevans very professional yet friendly with a great sense of humor. He's fantastic and I can't reccomend him enough! Excellent service. I did the semi intensive course during summer, with lessons scheduled on weekends and evenings in order to fit around my job. I passed my test first time thanks to Sevan's great teaching. He prepares you thoroughly for all situations thinkable, and gives detailed, constructive feedback to help you improve after each lesson. Calm, patient and a good laugh, Sevan is a great driving instructor and the LDC is a great method of learning, with great theory revision materials. Very happy with my results! I searched Google for a good Driving School, I found Sevan's LDC driving school. When I read his profile, skills and courses, I identified the page really interesting. I said to myself I found my instructor!!. I got good information. He helped me feel confident and prepared me thoroughly for the test , I done just one week pass intensive driving course and I had passed first time, thank you so much Sevan for all you help through the course, I feel more confident and safe driver. I totally recommend Sevan for all people who want to have good instructor. He is excellent, professional, patient and dedicated and he always on time. Thank you so much Sevan. After spending huge sums of money with another instructor and failing my test twice, I decided to go for the LDC course and choose Sevan as the instructor. The experience was outstanding, Sevan is patient, focused and dedicated; he was always on time (5 mins early actually) and taught me not only to pass the exam but to be a proper driver. He even picked me up at 6am on my exam day and accommodated my 7am exam time. I highly recommend Sevan as an instructor. 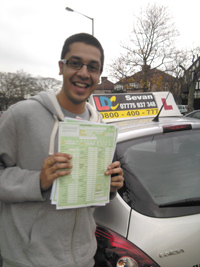 I learnt to drive with Sevan, and within two months I had passed first time with zero faults. I found Sevan when I saw his car parked in the local area. I looked at his website and saw he had a wide range of courses on offer. When I contacted him, he was extremely helpful and recommended the course that suited me best, which was the semi intensive course and he suggested a schedule of lessons which worked around my other commitments. He was prompt, reliable and is a patient instructor with a very structured approach. He helped me feel confident and prepared me thoroughly for the test. He is very professional and organized and taught me to be a safe driver. I am proud to have been one of Sevan’s students and I thoroughly enjoyed the lessons. I am grateful to him for all that he has done for me. Thank you, Sevan. I did the semi-intensive course over 3-4 weeks with Sevan and passed first time with only 2 minors. His excellent way of teaching helped me perfect skills that I was concerned about such as merging at high speeds and being confident with your right of way. He is a very patient instructor, so I’m confident he could make even the most nervous driver pass. I also did the pass plus course and found it to be very helpful with dealing with country roads and motorways. I think most students are too worried about actually passing the test. Once you’ve passed you need to remember those skills and put them to good use. Thank you Sevan for teaching me skills that I will use for as long as I drive! I did a 3-week intensive course this winter and passed first time. With Sevan, the teaching isn't just inside the car, it continues outside of it, with 'homework' that will make sure all the information sinks in to accelerate your progress. By virtue of structure, teaching ability and a friendly personality Sevan was able to adapt the lesson focusing it on the right things for me to learn at each stage making every lesson agreeable and instructive. With hundreds of tips and tricks, he seamlessly turned my driving from nervous and reactive to calm and systematic. His teachings are ones I will undoubtedly remember, for the rest of my life. Thank you! I was extremely nervous about learning how to drive till I met Sevan. He made me feel calm and at ease. He is professional, friendly and patient, with good sense of humour. It was an absolute pleasure to be his student and I cannot express how thankful I am and I can't recommend him highly enough! I am happy to announce I have passed the driving test with a PASS result first time round! As often Londoners do, I avoided driving lessons for as long as I could until a point where it got a bit embarrassing not knowing how to drive and a pain having to depend on public transport or cabs all the time so I decided to give it a go. I was quite sceptical and didn't believe driving was really my cup of tea but wanted to give it a shot nonetheless. 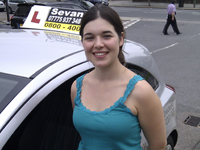 After having enquired around quite a bit and scanned several driving school sites, my husband came across Sevan's website and both of us began our lessons with him. I have to say, without doubt, it was best decision we took. 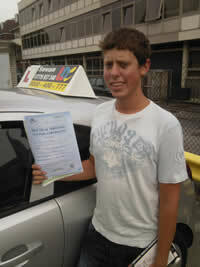 Sevan is a very knowledgeable and patient instructor and very professional. He makes it a point to understand the unique personalities and requirements of his students, their strengths and weaknesses and their approach. I was such a nervous driver, it can't have been easy for him to teach me but he worked at my pace, always encouraging and explaining things quite logically and never losing patience with my silly mistakes. As we continued with the lessons, he gave me an honest assessment of where I stood, which areas I needed to improve and also what I do well. I could feel myself improving with every lesson. From initially dreading my driving lessons I began to enjoy them eventually and looked forward to each one. My first test attempt was on 3 March and I passed. I am grateful to Sevan for not just teaching me how to drive but more importantly, how to drive safely and confidently. I wholeheartedly recommend Sevan, he is the best instructor ever. I started lessons with Sevan after lessons with my previous instructor did not seem to be progressing as I had hoped. The change was immediately noticeable. Sevan is an incredibly attentive instructor. He is encouraging, patient, excellent at explaining things, and has a knack for working out what it is that is going wrong, when something is! 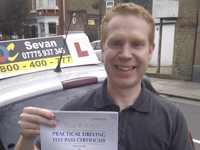 After switching to Sevan, my driving improved significantly and fast. We held our lessons in Wood Green, right around the roads that the Wood Green test centre uses, and so I was well prepared for my test. I took my first test in January 2017, and passed with only two minors. I'd hugely recommend Sevan to any learners. Sevan, Thank you for all your help. Honestly, I came back into learning how to drive again very apprehensive but you helped install so much confidence and reassurance in my skill set and me as a person. I'm so grateful for all your help and helping me to pass first time. You didn't just teach me how to pass the test; you put me on my first steps to learning how to really drive. Thanks, Jaydee Dyer. I approached Sevan with a very clear goal and specific timeframes. Having taken lessons as a 17-year old some 18 years prior, I needed to get back up to speed and pass in under two months as my first born was due. Sevan was extremely understanding and accommodating; after taking an assessment lesson he advised the booster course which also provided training materials I read around my lessons which accelerated my learning. Sevan's teaching style was excellent, he understood the way I responded best to learning and adopted an approach that best suited me. I felt that this gave me more input into my own learning process. Sevan invested a lot of personal time fitting in lessons for me to meet my deadline. I felt very prepared and relaxed by the time I passed my test on the 3rd March (first time) and subsequently driving my wife and son home from hospital a few weeks later. I am hugely grateful for his tutoring and would not hesitate to recommend him. With little driving experience and a bad experience with a previous instructor, I found a local instructor in Sevan. Over the course of my lessons, Sevan helped me to become a more confident, and safe, driver through his method of teaching. He takes the time to fully explain theory and the logistics behind driving as well as letting me make my own mistakes and subsequently learning from them. The student based style of learning coupled with Sevan’s calm, patient and focused approach is one that I would highly recommend to any aspiring driver. Thank you! 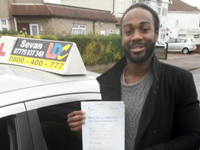 Hi my name is Emmanuel, I am writing this email to say a very big thank you to Sevan for helping me pass my practical driving test first time. I previously had some driving lessons with another driving instructor and had to stop because I realised I was not making any headway. But meeting Sevan was God sent. He is calm, encouraging, understanding, very patient, and makes you feel so comfortable. Sevan is an exceptional driving instructor. He is able to analyse your strength and weaknesses and turn your weakness into strength in no time with his unique teaching techniques. After a few bad instructors I nearly gave up on trying to get my licence but Sevan helped me develop the skills and confidence I needed to succeed.Sevan's patience and understanding along with providing lessons to fit my busy schedule helped me pass first time and I strongly recommend him to anyone looking to learn to drive. I had started learning to drive years ago but got nowhere with it, as being on the road just made me so nervous. Sevan really took the time to explain how things worked and answer all my questions so that I ended up having nothing to be scared of. He was always on time, the car was always impeccable, and I was comfortable driving with him. He was really patient and didn't put me forward for the test until it was clear I was actually ready. I passed first time and I'm super happy! Thanks so much! Hey Sevan, I just want to say thanks again for helping me pass my test and turning me into a competent and safe driver. I've just been on my first motorway drive, very enjoyable! You'll be my top recommendation to any aspiring drivers! Time was against me when I decided to take on driving lessons, as I needed to pass before a planned permanent move to France. I found Sevan's teaching both efficient and well organized and although I feared I wouldn't make it, his patient approach got me through in the end. Now I need to grow accustomed to driving on the right! I would like to commend Sevan on helping me pass my practical driving test on the first time of trying. I would recommend him highly to anyone wishing to do their practical driving test. What I found motivating when I did my practice with Sevan was that he always used positive reinforcement to build up my confidence. I found him to be patient with me when I did not do well and he highlighted my mistakes soon after they happened. He always put me in control of my learning which I found to be liberating. Sevan also communicated with me of any changes in our schedule well in time which made it easier for me to plan. If you want to learn and you want to pass, Sevan is your instructor. I started to learn with Sevan about 3 months ago and my driving was really bad. When I started I had one dangerous and four serious faults from my previous results with other instructors. Sevan was such a good teacher. He is one of my good teachers I ever met. He changed the way I was driving, all the time referring to the Highway Code and giving me practical feedback. He gave me confidence. I passed my driving test and now I feel so confident that within one week of passing I got a car and my life changed. After 3 fails with another instructor, I had just lost all hope of passing my test ever. Sevan Sir was God sent to me. The best bit about him is that he just does not train you to pass but to be a safe driver for the rest of your life! He never shows anger, frustration and is kind and every adapting to students needs personally and most importantly he is punctual beyond words could describe. What more could a student ask for? I would highly recommend him to all my family and friends. I would like to take this opportunity to thank him again and giving that light of hope to me who had lost all of it until I found him. I had no experience of driving prior to meeting Sevan so I was quite nervous about it at first. However, Sevan was understanding of this and made me feel at ease. I was really impressed the way Sevan developed my driving ability and made me more confident in the process. 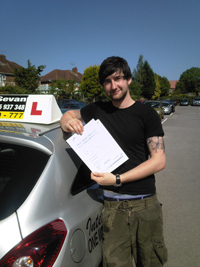 Both his driving and teaching skills are brilliant and I found my lessons to be enjoyable. 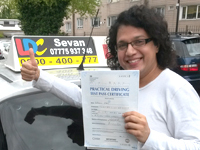 Sevan showed great enthusiasm for me to succeed, and ultimately I passed my driving test. It was my first attempt. So Sevan, I wish to thank you for your support and help in reaching my goal. Thanks to the help of Sevan, I passed my practical test in my first attempt. Besides his extensive knowledge of driving rules and technical information, Sevan is also well aware of different learning and teaching techniques and he applies a range of methods depending on the situation. He points out what you should do and how you should do it, but he also explains why you should do it making you understand driving. Even more importantly his teaching style makes you feel fully comfortable with driving for hours. His professionalism and friendliness put you at ease and keep you motivated. He always remains calm and maintains his perseverance to eliminate mistakes and improve driving. Sevan is a great instructor and I would highly recommend him without a second thought for anyone! I would really recommend Savan as a driving instructor. My friend recommended him to me and he is fab! He was very professional throughout, making me feel calm and ready to drive. He was very patient, friendly and made my lessons fun! He helped me to pass fairly quickly and put me at ease. Thanks for the help and being patient with me! Many thanks to Sevan for teaching me in a very shot time just two weeks before my theory test expired on the 14th March. I had taken some lessons previously with another driving instructor but stopped as I didn't feel I was getting anywhere. I just felt like he was interested more in the money than teaching and having a bad experience after wasting all that money. I felt like giving up after taking a six month break. I went online and found LDC Driving School and contacted Sevan. We hit it off straight away. I told him about my theory test expiring within three weeks. He then organised a 1 hour free assessment and suggested that I take the Test Booster course. I decided to go with Sevan because of all the positive testimonials and they're not wrong. I left it to Sevan and he organised and booked the test and with just 15 lessons I passed just one day before my theory expired; what a result! Sevan is a truly excellent teacher, I had struggled to master roundabouts and lane discipline with my previous instructor. He targeted my weaknesses and literally boosted my confidence until I was ready for my test day .Thanks to his patience and experience and his high professional skills and efficient way of teaching using the LDC Workbook means that you get the best out of him in the shortest time possible . More importantly he teaches you for your own road safety, not just to pass your test. I can not thank him enough. Thank you so much Sevan for making it possible for me to pass. Thank you once again. After a couple of failed attempts about 15 years ago, I finally decided to take up the challenge again at the tender age of 36. I chose Sevan on the strength of his testimonials and after reading about the LDC system. Sevan really is a great instructor, he is very encouraging, offers good constructive analysis and has the uncanny ability to remember every single manoeuvre taken on any given lesson. As well as Sevan's great tuition, I found the mock tests particularly useful. I didn't have time for the fully intensive course so paced my block of 30 hours at about three hours per week. Thanks to Sevan's teaching methods this was easily enough to see me through and my first attempt ended with those magic words... "You've passed"! I left getting my driving licence quite late in my life, well into my thirties. All my previous attempts have been stressful and nerve-racking. And this is when I came across Sevan and his company. I cannot express enough what a difference it made to me to have him as my instructor. He has a brilliant ability to make you feel at ease and to make sense of what is happening on the road and how to handle it. From a very stressed and anxious learner I have quickly become positive. All of a sudden things made sense and other road user became predictable and not just erratic floating objects on the road. Sevan's teaching manner is calm, positive and encouraging . 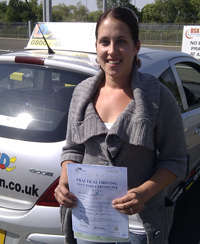 As a learner I could relax and know that I was improving and getting closer to being an independent driver. I have passed my test at the first attempt!!! I would just like to let everyone know how this began for me. I had a bad experience with my previous driving school and so I decided to search on Google "Best driving schools" and found LDC. I looked them up on their website and I came across their instructors. So I called one of them up, his name is Sevan. Quite frankly I was a very sensitive person, I had no confidence because of my last instructor. When I met Sevan he was truthfully patient and calm and made me feel at ease and comfortable. I would just like to say I don't think I would have been able to pass without this man's help. I'm so happy, thank you so much Sevan. Sevan is such a great instructor. He was so patient and made me so confident on the road and his teaching skills helped me learn; not only how to be a good driver but also to be a safe driver. I would highly recommend Sevan. He is an amazing teacher. Thank you so much for helping me pass! I have had a full motorbike licence for ten years so understood the roads a fair bit but had also picked up some bad and strange habits, but with Sevan's excellent teaching I passed the test first time with only one minor fault. I learnt on and off for a couple of months and then a bit more intensively for 2 weeks. 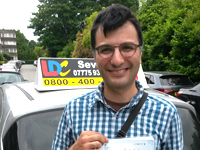 The LDC system and Sevan's teaching was efficient and very organised and I progressed well and really felt I was learning useful stuff, not just for the test but more importantly for the rest of my driving life. I would whole heartily recommend Sevan as he is a great teacher and great guy. He has a real eye for detail and gives great feedback. I am very, very thankful for your patience and dedication. More than just a wonderful driving instructor, you have given me a lot of self confidence so that I could achieve my goal. Sorry for the Brazilian way I am way too cheerful and loud. I cannot express in words the wonderful feeling of freedom you have given me to pass my driving test on the very first exam. Thank you again for being such a dedicated, understanding and especially extremely professional. I highly recommend Mr Sevan. Sevan is a great instructor. I highly recommend him to anyone who is eager to pass the test. His professional and constructive coaching method is definitely the key to my success of passing test. I had not driven before. Hence, I took Semi-intensive course aiming to pass the test in short period of time. As the time passed along, I realized the challenge and difficulty of passing test. At some points I had planned to retake the test. However, Sevan went extra mile by giving up his day off to help me polish my driving skills in the last minute. This clearly reflects who he is. Without shadow of doubt, I will definitely recommend him to my friends. "Sevan is a very conscientious instructor. He explained things very well, and made sure that I would be a safe driver, not just focusing on passing the test. Having said that, I felt confident that he had prepared me very well for the test when I went to take it. Thanks Sevan!" I found that Sevan's method of teaching and patience with my pace of learning invaluable in getting me to pass my driving test. I would highly recommend him. Thought I'd never learn to drive! Passed first time with 5 minors only. Thank you so much for your patience and your professionalism all the time. 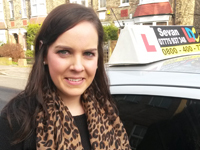 "After a 10 year break in lessons I decided to take up driving again. I wanted to pass quickly and so did 30 hours semi-intensively, starting with 1 or 2 lessons per week followed by 20 hours in 5 days. My test was postponed due to snow, but Sevan happily rescheduled and I passed first time. The LD system has a good structure so I felt like there was a clear plan and focus for each lesson. Sevan is very professional, patient, a good teacher and, importantly, a thoroughly nice chap. Recommended." 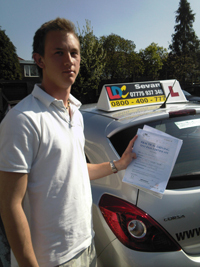 "The LDC system was a great way to learn and Sevan really helped me to improve my overall driving technique." 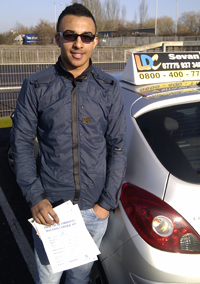 "Sevan has been a fantastic teacher whose knowledge of the road and test got me to pass first time! I never expected it, but I guess I underestimated how great he was at passing his knowledge on to me. 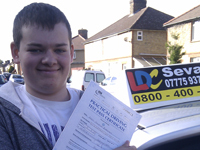 LDC is the only driving school I would recommend because it's organisation and planning leaves no stone unturned. 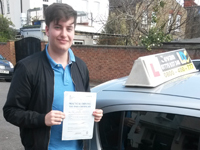 Thanks Sevan, driving has been great :)"
"I passed my test first time thanks to Sevan and his calm, patient and encouraging way of teaching. He always focused on the positive which means you build up confidence, but goes over all technique until he is sure you are proficient in each area. He explains things very clearly and is great fun and always punctual as well. I will be recommending him to anyone who is looking for driving lessons. Sevan is a really, really great driving instructor." "I came to driving later in life (in my 30s), feeling rather anxious and under-confident at the prospect. Sevan was just the instructor I needed. Endlessly patient and calm, but also firm (in a gentle way) when it was needed. He seems to enjoy his job and this rubs off on the way he teaches - with a lot of integrity and respect for his pupils. I would heartily recommend Sevan to both anxious drivers and those with more confidence and/or ability. His is clearly able to adapt to each driver's pace of learning and tailor his lessons to their needs. Thanks Sevan!" 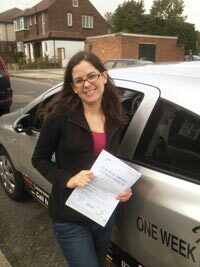 "I passed thanks to Sevan who is calm, patient and good company which helps put anxious people like myself at ease. Highly recommend this amazing teacher!" "Having been a passenger in a serious accident 20 years ago I was terrified of driving, and I put it off until I was 40. It took me a while to find an instructor I could work with, but I ended up choosing Sevan despite the fact I live an hour away from Barnet. Sevan was very patient with me and managed to get me to overcome my fears to the point where I was driving calmly and confidently. Sevan is significantly better than the competition, and I would recommend him heartily to any learner, regardless of age and experience." 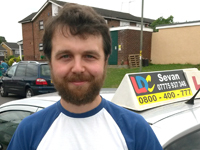 "When starting my driving course with Sevan I found he was a very calm and patient teacher. I felt confident and comfortable as Sevan was very reassuring to my mistakes. 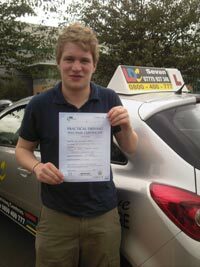 His experience as a driving instructor was very professional and in the space of a month I had passed my driving test with low minors. I would highly recommend Sevan as a teacher because with him as an instructor and the step by step dvd set it made my learning experience easy, quick and also very fun! Thank you Sevan." 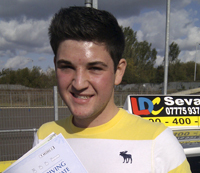 "I would highly recommend the LDC driving school as I did an intensive course of 15 hours and passed first time with only 2 minors, all thanks to Sevan." 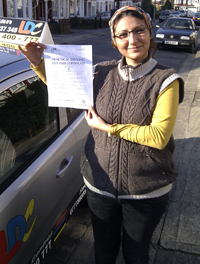 "Learning with Sevan was a very rewarding experience and an investment to driving. (Take it from me, I've had lessons with other instructors in the past)." 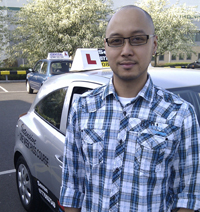 For anyone that is looking for a driving instructor, here is one that is friendly, calm and relaxed in his teaching methods. He not only builds your confidence, but also offers a more in-depth knowledge, giving you a greater understanding when developing your driving skills. The proof is in the pudding, I passed with two minors. Thanks Sevan for all your help." 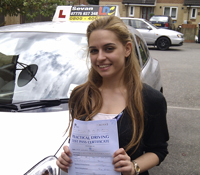 "Having completed the semi intensive course and passed my driving test first time, I would be happy to recommend Sevan to any learner. He is very patient and strives to put you at ease. He is also very methodical in going through all the different topics of the course as well as identifying the areas that need to be improved." 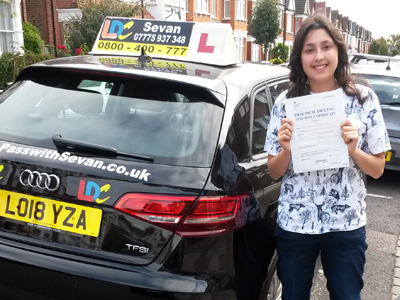 "Thank you Sevan for all the help and direction you gave me and for helping me accomplish a first time pass. Your training methods are spot on. I paid attention, listened, looked and looked again. With your confidence and encouragement I found it quite easy. 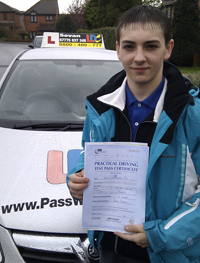 I shall pass on your number and your website to all those considering driving lessons." 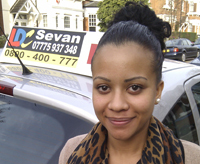 "I passed first time with Sevan. 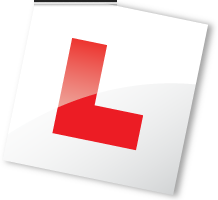 If you are looking to be a safe, confident and knowledgeable driver and possess the skills required for lifelong correct driving then this is the instructor to help you achieve this and so much more. 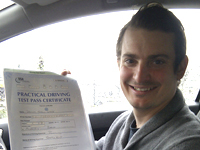 Euan"
"I found the theory and hazard perception DVDs a great study guide and helped me pass my theory first time. The practical driving lessons were split up in to easy to understand chapters which made the driving lessons easier to take in piece by piece. I really enjoyed my time with Sevan, it seemed to fly by some days. I always felt very relaxed and comfortable with him and with the car and would (and have) highly recommend him all day long"
"A very professional and truly conscientious instructor with a passion for teaching the right way. Always patient, methodical, and encouraging. Learning with "passwithsevan" is an excellent investment for the future. Sevan's freely supplied book LD System Workbook, was also a great help." 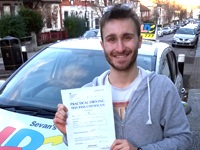 "Driving with Sevan was a great experience, due to the fact that he is a fantastic teacher. He not only prepared me for my test technically but also mentally. When learning how to drive you need a teacher that is going to encourage you and adapt to each students needs individually, with Sevan I found that in his teaching. He loves his job which reflects in his teaching, which I can honestly say makes a difference when learning as his passion for driving and teaching rubs off on you. I believe that the LDC way of learning is innovative and unique to other ways of teaching, more home study meant that I had more time on the road driving. Thank you again Sevan for teaching me and making me believe in something I thought I could never do"
Clayton passed his practical test with 3 minor faults… well done Clayton. "Driving with Sevan was a great experience. He was always encouraging and pointed out where there was room for improvement. 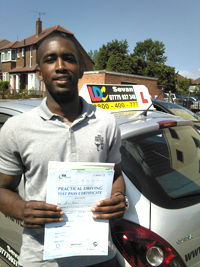 He made the lessons seem easy and when I was ready for my test I was confident and passed first time." 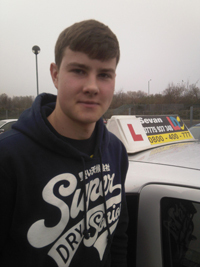 Kieran passed the new Independent Driving test FIRST TIME with NO FAULTS at the Barnet Test Centre! Awesome! "Sevan is a great teacher; he is extremely patient and taught me in a way that is both relaxing and enjoyable. Sevan is extremely punctual and offers great advice on ways to improve your driving, to make you a safer driver. The LD System I found worked for me as most of the learning was done by me at home so during my lesson more time could be spent practising the specific manoeuvre. Also, the book provided me with extensive knowledge that will also help me as a driver in the future. The LD System teamed with a great instructor such as Sevan resulted in me passing my test first time without any faults. I could not give Sevan any higher praise he was an amazing teacher." 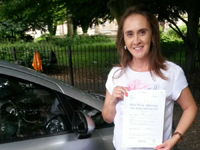 "I held an American driving licence for many years before moving to the UK, so I have to admit that I wasn't looking forward to having to retrain from scratch in order to qualify to drive in the UK. I actually hadn't driven in years, though, so the course was an excellent way to brush up on the basics and gain an understanding of how the UK approach differed from what I was used to. The course materials were very helpful and well structured. I used the workbook and completed the corresponding exercises before lessons, which gave me some familiarity with what would be covered at each session. Sevan also referred regularly to his instructor's materials during the lessons and those diagrams often helped to further clarify the skill we were working on. I grew to feel much more confident in my driving ability and went into my test feeling a little nervous, yes, but also confident that I knew everything I needed to know to pass. And I passed on my first try. 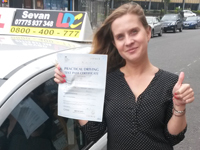 I am a better, more confident driver now because of Sevan's excellent instruction and I would not hesitate to recommend him or the LDC to anyone wanting to learn to drive." 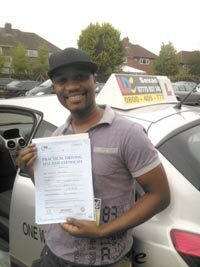 John who stars in Thriller Live at the Lyric Theatre in London's West End trained on the Semi-intensive Pass Course and Passed First Time! "As an anxious driver who literally had fear of driving as a child it was extremely important to get an instructor who could understand my setback from learning to drive. I did an internet research for instructors in Barnet and came across Sevan. After our first trial lesson I instantly felt he was the one to get me there. It wasn't a smooth learning journey as my anxiety grew with making silly mistakes but Sevan never allowed me to give up. I also didn't want an instructor who was too easy going so Sevan's tough love made me push through. Simply the Best instructor I can recommend for anyone." "The course was very good, taking you through all the stages step by step allowing you to build up your driving skills gradually. 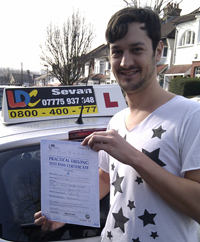 Sevan was a very good instructor, he was always very patient allowing me to progress at my own pace. 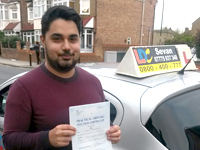 Sevan always has high standards and this is reflected in his punctuality, always turning up on time and the cleanliness of his car"
Will Burgess trained on the One Week Pass Course and passed his practical driving test the first time at the Enfield MPTC. Congratulations and well done Will! Sevan's style of instruction is professional, insightful and effective. His endless patience, cheerful sense of humour and steady composure made the test preparation straightforward and easy. I went into the test confident and passed on the first try. I recommend him without reservation! Passed his test first time with 4 minor faults. 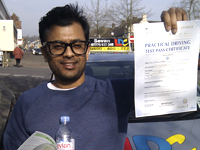 "Great teacher, calm and accurate... First time pass! A+!" 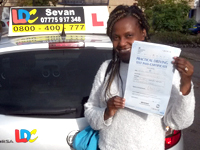 "The One Week Pass Course with Sevan is an effective and organised course which I will recommend to anyone who wants their licence as soon as possible.. A week ago I was a novice and today I proudly held my licence. Sevan's organised and patient approach will put you at ease and bring out the best in you". 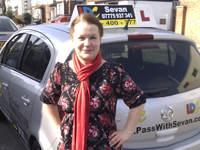 "I had never been behind the wheel until learning to drive with Sevan. I was nervous about driving first time but Sevan made me feel relaxed from day one. 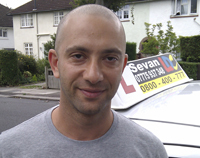 I really enjoyed my lessons with Sevan, he was very patient and always made sure I was driving safely. I found Sevan to be a genuinely nice guy who always encouraged me. I would highly recommend Sevan to anyone thinking about learning to drive. Thank you so much Sevan, couldn't had done it without you." "Dear Sevan, Thank you very much for the excellent training you gave to me. I am delighted that I passed the Driving Test yesterday, and for the patience and confidence you had in me. 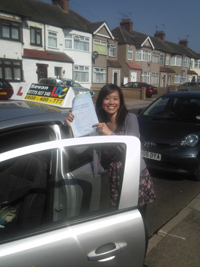 All the best, Xirong"
"Well done Sam for being such a competent safe driver and for passing your test with so few faults." 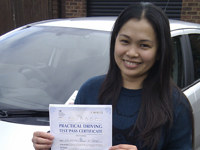 "At the end of last year I decided to learn to drive and get my full UK driving licence. After I passed my Theory Test I spotted an LDC car and wrote down the number of the instructor from the side of the car. The instructor was Sevan. First of all I was suprised when Sevan came to my home and offered me a half hour free driving check to decide which course would be most suitable for me. Sevan was never late at any appointment and used all time I paid for to teach me. I noticed that Sevan is passionate about safe driving and I felt that he wanted me to learn to drive safely and not just to pass the test. After 30 hours of tuition with Sevan I passed my test with 2 minor mistakes only ! Doing my test in one of the hardest DVSA centers which is Wood Green. 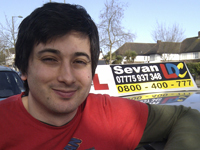 I'm going to recommend Sevan to all of my friends looking to learn to drive and pass the test in the UK. I'm really glad that I met Sevan"